My friend Paula Bernstein’s book Identical Strangers: A Memoir of Twins Separated and Reunited is going to be in bookstores on Tuesday, October 2nd. Everyone has a book coming out! Paula is also going to be on “CBS Sunday Morning” this Sunday, Sept. 30th at 9 a.m. ET (and I am DYING of envy). Paula found out a couple of years ago that she had an identical twin sister, who was living in Paris. Can you imagine?? From Publishers Weekly: In this transfixing memoir, Bernstein, a freelance writer, and Schein, a filmmaker, take turns recounting the story of how each woman, at age 35, discovered she had an identical twin sister … Once you find someone, Bernstein writes, you can’t unfind her. 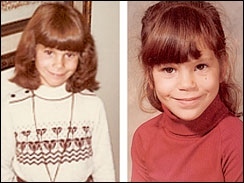 That’s Elyse on the left and Paula on the right, at age seven.